After a successful round of online flash sales, Realme Philippines adheres to the demand of consumers for offline store availability. #RealEntryLevelKing Realme C1 will be available at MemoXpress SM City North EDSA starting Dec. 16, 10 a.m.
Customers are invited to join the grand flash sale and get freebies worth P1,190 with Realme Influencer Apple David. 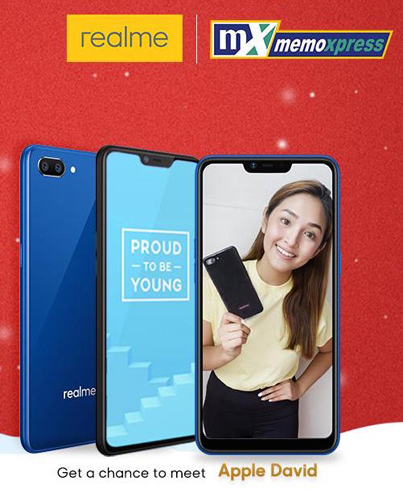 MemoXpress, one of the country’s largest smartphone retailers, will carry the Realme C1 with a one-day grand sale at SM City North EDSA on Dec. 16, 10 a.m. to 12 noon, where fans and fans-to-be can expect loads of freebies and surprises. “Realme is a brand that listens to its consumers. We hear the clamor of Filipino fans for the Realme C1 to be made available in regular stores. To address the needs of users, we partnered with cell phone retail giant Memo Xpress. We are deeply flattered by the warm welcome we got on Lazada. We thank everyone who supported us during the 12.05 Flash Sale and the Grand Year End Sale. To those who are yet to experience the performance and style of Realme C1, see you in our Grand Flash Sale,” said Realme Philippines Chief Operating Officer Jacky Chen. Customers who will purchase a Realme C1 in-store from 10 a.m. to 12 noon will enjoy a special price tag of P5,490. Even better, the first 200 customers to purchase the Realme C1 will get to pick a prize, either a Bluetooth speaker worth P590 or a Realme community T-shirt worth P500. The purchasers will also get a MemoXpress e-voucher worth P100. A total of P1,190 of freebies and discounts per customer will be given away. To further amp the excitement, customers will receive a raffle coupon for a chance to win a Realme 2 Pro! By 1 p.m. of Dec. 16, he Realme C1 will be officially available in 24 MemoXpress stores metro-wide at the original price of P5,990. Apple David will formally start the program on Dec. 16 at MemoXpress, SM City North EDSA. Early patrons will get the chance to join the fun series of mini talks on what “Power Meets Style” means for the tech consumers of today. The Realme C1 is expected to shake the entry-level smartphone market even more now that it is available at MemoXpress. The Realme C1 has established a growing fanbase because of features such as mega battery, large full notch screen, and powerful processor that are unmatched in its price segment. With its highly competitive price tag and high-tier performance and style, the Realme C1 will continue to change the game.